Citizens for a Pro-life Society Director and 15 Other Members will appear in South Bend Court-- Wednesday, June 3rd for their protest of the Obama Notre Dame commencement speech on Sunday, May 17, 2009. They are charged with trespassing on the Notre Dame campus and will be represented by attorney Tom Dixon from the American Center for Law and Justice. The arrest occurred when Dr. Monica Miller, Felician Sister Lois Marie, 5 college students and others walked on to the parking lot of the Joyce Center where, just prior to the start of the commencement, they made an attempt to show photos of abortion victims to ND students lined up to enter the building. These were photos of aborted babies that members of CPLS retrieved from the trash dumpsters behind Woman Care abortion center in Lathrup Village, MI and Woman's Advisory abortion center in Livonia, Michigan. Let me explain my philosophy behind pleading NOT GUILTY to the charge of trespassing at the University of Notre Dame First of all, our attorney, Tom Dixon, doesn't believe that we are even legally guilty. We should give him a chance to advocate a defense for us. 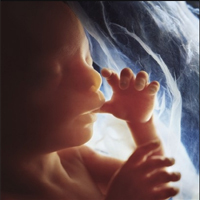 However, even if we know that we could never prevail legally in court-- when we plead not guilty we are saying that we stand with the aborted unborn to whom we bore witness. We were a voice of truth in a situation that needed the truth to be spoken. Our advocacy for the outcast unborn was needed and morally justified by the fact that a Catholic university actually invited the primary, most powerful, most visible supporter of the unjust law of Roe v. Wade to give the commencement address and then bestowed upon him an honorary Doctor of Laws degree. Fr. Jenkins and the Notre Dame Board of Trustees is guilty of betraying the Catholic faith. We cannot be guilty for doing what is right--even though the law may claim that we are. Please pray for us!